Heineken has reunited with fellow Netherlander, and legendary DJ, Tiësto to launch his newest album, "Kaleidoscope." The two Dutch icons will kick off a seven date tour where fans will have the chance to win premium upgrades, including a backstage meeting with Tiësto, autographed merchandise and exclusive VIP access within each venue. "Heineken loves to bring new premium experiences to the consumers and we share a passion with Tiësto fans for world-class music and premium lifestyle experiences," said Filip Wouters, Vice President Marketing Heineken. The Tour will kick-off in New York City, with shows at the Hammerstein Ballroom from September 24-26th. On October 31, Heineken will bring Tiesto to Chicago's Congress Theater and will wrap up the tour with three shows November 25, 27 and 28 at The Shrine in Los Angeles. Tiësto said, "It's great to work with Heineken, especially because we share the same heritage. They are huge supporters of quality music and art, so the partnership is a natural fit." Heineken has traditionally devoted a sizable portion of their sponsorship budget to live music experiences, such as their ongoing concert tour, Red Star Soul, which is an invite only event in nine cities. "Our goal is for fans to enjoy Tiësto in an intimate venue as they never have before and experience a show that could only be brought to them by Heineken," said Wouters. "Through our exclusive upgrades, fans can get closer to the action and really feel as if they're part of the show." Audience members above the age of 21 receive wristbands at the door to signify that they are of legal drinking age. A number is printed on each wristband and guests holding wristbands within a designated numeric range will receive special access to the Heineken VIP Lounge. Members of the audience will receive a shortcode to where they can text their Heineken Wisdom Lines -- or inspirational text. The text messages then appear on screens located throughout the venue and random winners will receive a confirmation text back telling them where to go to redeem their prize. 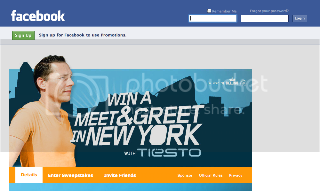 Fellow Dutch company, KLM, is also running a promotion around Tiësto's New York City concert dates which ncludes a Meet & Greet Sweepstakes with the legendary DJ. The prize includes air travel, a three night hotel stay and a backstage meet and greet after his September 26th show.